My visit to Hong Kong this August opportunely coincided with the Hong Kong International Tea Fair. 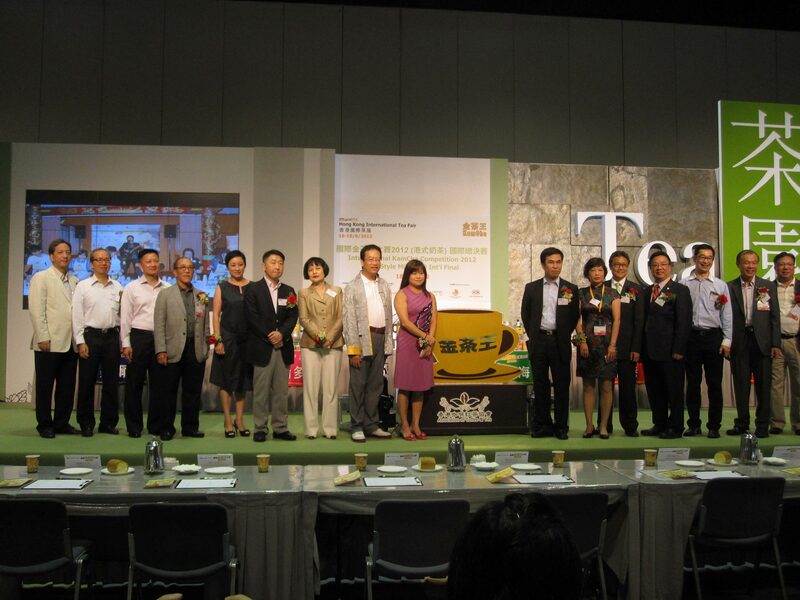 It is one of dozens of trade events produced every year by the Hong Kong Trade Development Council. I was only available to attend on Sunday which was open to the public, so it was crowded. 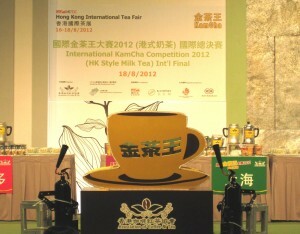 As luck would have it though, it was also the day of the 4th Annual International Hong Kong-style Milk Tea Championship. I thought this would be a small sideline, but it turned out to be the centrepiece of Sunday’s events. 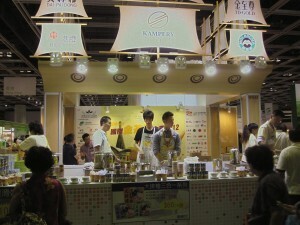 A pavilion inside the entrance was serving samples of Milk Tea to a long queue. Hong Kong-style Milk Tea or “Kam Cha” became popular in the 1950′s, influenced heavily by British Colonial traditions. Made from a mixture of black tea leaves, warmed evaporated milk and sugar, it has become entrenched in daily HK life. They consume 900 million cups annually. If you have a Cantonese Chinatown in your city, chances are they will know how to prepare it. It’s not to everyone’s taste, particularly if you don’t like milk in your tea and even more so if you don’t like evaporated milk. I tasted something familiar in its creaminess – perhaps memories of using evaporated milk on camping trips? Hong Kong residents prefer a strong component of tea in their cup. The Championship took place on the stage at the back of the Conference Hall. For almost an hour, the crowded audience sat through the pomp and speeches of celebrities, dignitaries and sponsors, before the 6 contestants were paraded onto the stage and made their way to the prep stations. Just as I had decided to move away from the area to explore the trade show, I heard the announcer say, “Harvey Lin of Toronto Canada” – what? I decided to watch the event play out though I admit I did take a little wander to nearby booths during the lengthy show. Each time I returned Harvey was holding his own and seemed to be intent on his technique. Holding pots of hot liquid high in the air, pouring and mixing like a mad chemist. See more pictures on The Association of Coffee and Tea of HK website, as they were major sponsors of the event. From top: Harvey Lin pouring his blend through a cloth filter; Duty weighs heavily on the jury; Harvey Lin - the new International Milk Tea King! When the winner was announced and it was Harvey, I thought, cool! I’ll interview him! But I couldn’t get anywhere near him. He was now the crowned Milk Tea King! – an International honour that would follow him for months – maybe years. When he returned to Canada he caused a sensation in the Scarborough/Toronto community and beyond. I managed to snap some photos of him at the Fair giving a shout out to his home town, but it wasn’t until 6 months later that I got that interview. It turns out that in the months following the contest, Taiwan-born Harvey Lin, age 32, of Marathon Donuts in the Scarborough area of Toronto, has become a celebrity, attracting visitors from the US and Vancouver. They want to see his trophy and try his famous Hong Kong-style Milk Tea. He and his establishment have been so popular, that in November, he was able to open a second location in Richmond Hill – Marathon Café. What was his secret to winning? He says he was well-trained in Milk Tea preparation 5 years ago by Marathon’s former owner. Harvey progressed to the point where he was able to improve on the method by adding his own signature to the beverage. 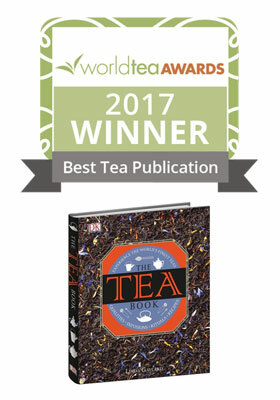 He mixes a ‘classified’ blend of tea leaves and applies a scientific approach to prep with exact calculations and timing. In Hong Kong, he had 3 days to practice on site with the equipment provided. Will he be returning to Hong Kong in August 2013 to defend his title? He says not. He’s too busy with the new location. I’m sure, with his skills, he’ll be riding on his laurels for years to come. 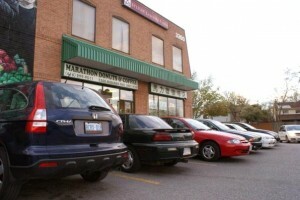 If you’re in the Toronto area and would like to try his Hong Kong-style Milk Tea, you can visit Marathon Donuts in Scarborough (this is where the trophy lives) or Richmond Hill. Call first though if you want to be sure the champ is there to make it for you in person! Great read Linda. I am actually more intrigued by you. I didn’t even know there was a tea sommelier! So I have a question and I was wondering if you can help me with this. I would like to create the worlds best tasting iced milk tea and I would like to have your opinion of the best iced milk tea. When I brew mine, I brew a strong concoction of Assam and Ceylon blk tea, with the ratio of 2:1, approximately 3 teaspoons of leaves per cup. I let steep for about 10 minutes and then place in fridge. I then make a brown sugar syrup and place 2 teaspoons of it inside a shaker. I then pour two tablespoons of organic condense milk and the cup of chilled tea also in the shaker. I give it a good 30 sec shake and pour it in a cup of ice. Do you have a different tea mixture for your milk blk tea or a different method? Please share. I would love the opinion of a tea sommelier like yourself. Did you know that most tea houses keep their milk tea a secret? I live in San Gabriel valley and it is boba milk tea central here. I think a place called half / half makes the best one. They will never tell you what their tea is. Even the workers don’t know because in most places, the owners prepare the tea mixture for the employees. I’ve even gone to tea shops where they sell the tea leaves in bulk to these tea houses and even the owner doesn’t know the milk tea ratios. I’ve asked two and one said it is Assam and Ceylon and another says its oolong and Ceylon. And amoung each type, then there’s all these grades. I have tried both versions and prefer the Assam / Ceylon combo. Please help. Linda, did you ever ask Harvey the type of uses? Is it a brand or is it a concoction of various blk teas? It would be nice to know the worlds champions recipe!!! Sounds like you are having a pretty good time concocting your iced milk tea recipe! 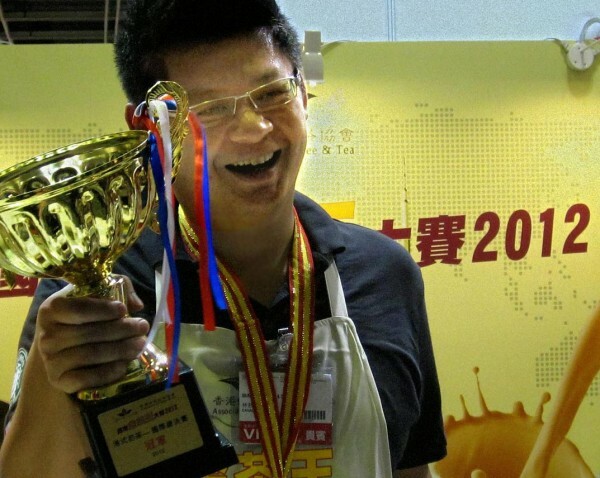 You are right that most sellers will not reveal their recipes, including Harvey Lin. 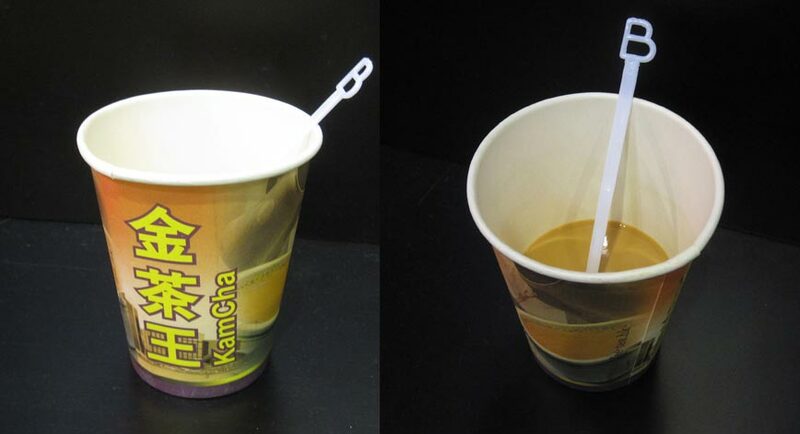 You may notice that if you prepared the milk tea hot it would taste different from milk tea iced. Some aromatics do not come to the fore when tea is cold. I have a recipe for Hong Kong Milk tea in a book that is being published this summer (July 2015). I will be writing a post about the book next month. I suggest adding some Chinese black tea, like a Keemun to the mix as it gives a deep malty flavour that brings an added natural sweetness and anchors the other flavours. In my recipe I use 1tbsp each Ceylon, Assam and Keemun. For 900ml (approx. 30 oz) of made tea I add one whole tin of evapourated milk and 3 tbsp cane sugar, but I like your idea of syrup, particularly when you are using a cocktail shaker. In Canada, sweetened condensed milk is much thicker and sweeter than evapourated milk. I used the brand “Carnation” – not sure if that’s available in US. There are indeed many styles of milk tea. Flavour is a very subjective thing – what you like, may not be the most popular. Best to ask friends and colleagues to taste and give feedback if you are going to sell it. You could offer several styles of iced milk tea. Good luck with the experimenting! Linda, thanks for your suggestions and I will definately look for that book when it comes out. Keemun, I must say I’ve never tried that tea yet. There’s a tea shop called wing hop fong in my area and will be going there in a minute to pick something up. You must consider opening a tea house yourself! As for me, I am planning to open a donut shop and having milk tea in the menu. Yes, Harvey kind of inspired me. I was looking at Harvey’s facebook, and he actually sells his tea blend. The price is actually reasonable. Take cares and thanks again. Linda… Keemun…. Genius. It did add that missing flavor I was looking for. It kind of taste like Assam, but more subtle and your right… A bit maltier. Thanks for your insights. Fantastic! Keemun is great on its own as well, for those times when you want a simple and delicious cup of hot black (in China they’d call it red) tea. So glad it worked out.